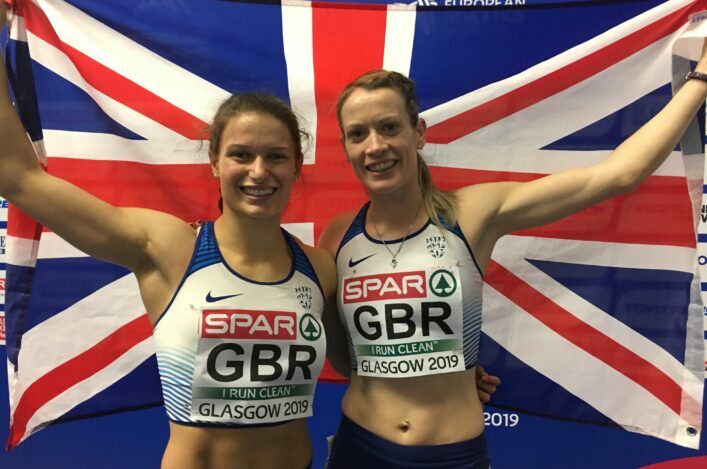 Great Britain international Rhona Auckland and north east youngster Naomi Lang both set new records with impressive performances at the Balmoral races over the weekend. The Saturday morning mist and rain cleared away allowing the sun to come out and brighten up the whole occasion. And it wasn’t long until the first winners of the day were being cheered home. Ben Cameron, a member of Forres Harriers, won a highly competitive MPH primary schools boys’ 1.5Km race in which five seconds separated the top three finishers. Aberdeen’s Laura McNeill won the girls’ 1.5Km in 6:10. Next up was the Kongsberg secondary schools 2.5Km in which Aberdeen AAC’s Stewart Millar missed the boys’ course record by two secs when winning in 7:01. The Alford Academy runner, a past winner of the primary schools race, pulled away from 2013 winner and course record holder Lewis Barnsby (East Sutherland) over the second-half of the route to win by nine secs. But while Millar’s performance was excellent, it was more than matched by Naomi Lang (Aberdeen AAC) who knocked 15secs off the girls course record when taking top spot in 8:03. The previous mark had been set by Gemma Cormack in 2006. It was a case of third time lucky for the Aberdeen Grammar pupil who had finished second in 2012 and was fourth last year. There’s little doubt that the classiest performance of the day came from Rhona Auckland in the ConocoPhillips 5Km. The 20 year-old Banchory Stonehaven AC runner finished second overall from a field of almost 700 runners and her time of 15:55 knocked a massive 40 secs off the mark she set in 2013. It’s the third year in a row that Auckland has won and the third year in a row she has broken the record. Jenny Bannerman (Inverness Harriers) finished in second position in 17:35 and Gemma Cormack (Aberdeen AAC), who won the secondary schools girls race in 2006 and was third in the 5Km two years ago, was third in 18:39. Carolyn Milne (Garioch Road Runners), the 2012 Balmoral 10Km winner, picked up the over-50 age group prize when finishing fourth in 18:54, two secs ahead of Aberdeen’s Debbie Moore who would also go on to finish fifth in the 10Km! Ali Hay (Central AC) hopes his second ConocoPhillips 5Km men’s race victory in three years will boost his hopes of Commonwealth Games selection. The Linlithgow runner, who represented Scotland in the 1500m at the 2010 Commonwealth Games in Delhi, led from the start and went on to win in convincing style in a time of 15:09. North of Scotland under-17 cross country league winner Ross Gollan (East Sutherland) was runner-up in the men’s race in 16:01 while another teenager, Jordan Chapman (Aberdeen AAC), was third in 16:08. Deeside runner Robbie Simpson successfully defended his title in the Stena Drilling Tartan 10Km but the Great Britain mountain running international was just a little outside the course record he set last year. Simpson, 22, made a strong start and only marathon running specialist Ross Houston (Central AC) was able to match the north east man’s pace in the early stages. Robbie eventually opened a gap of close to 400m as he powered home in 31min 30secs, 13 secs outside the record he set in 2013. Houston, the 2008 winner, who is waiting for his Commonwealth Games marathon selection to be confirmed, was runner-up in 32:25, while 2009 Balmoral champion Keith Hood (Corstorphine AC), competing in the Deeside race for the 14th year in a row, was a further 25secs behind in third position. Alan Reid (Peterhead Running Club), won the prize for being the first kilted runner when finishing 12th overall in 37:27. It was the fifth time he has won this award in ten years, and the first time he has competed at Balmoral since suffering serious injuries in a road traffic accident in 2011. Veteran Aberdeen runner Carolyn McLeod won a hotly contested women’s 10Km in which 15secs separated the first three finishers. *Harry Smith put his local knowledge to good use when winning the Balmoral 15 mile trail race on day two of the weekend’s festival of running on Deeside. The 23 year-old, who works as a seasonal ranger on the Balmoral estate and lives next door to the castle, looked remarkably strong as he powered through the finishing line in 1.29.06. It was an even more impressive performance given that Smith had also finished fifth in the previous day’s 10Km. Aberdeen’s Ben Hukins (Ron Hill Cambuslang Harriers) overcame a sickness bug to battle round in 1:31:22 to take second position while Deeside’s Colin Dempster was third in 1:33:19. Veronique Oldham (Cosmic Hillbashers), who has twice been runner-up over the past three years, took top spot in the women’s division of the race in 1:48:13. Aberdeen’s Sarah Simpson took second position in 1:50:10 and Banchory’s Nicole Akeroyd was third in 1:52:16. Stena Drilling Tartan 10Km champion Robbie Simpson wasn’t the only member of the family to pick up a prize at Balmoral this weekend. The Great Britain mountain running international’s dad Graeme added to the Simpson prize collection by finishing third in Sunday’s Wee Trail run. The three-mile race was won by Aboyne’s Calum Kitching. The Banchory Stonehaven AC runner, who was third in the previous day’s secondary schools 2.5Km race, recorded 20:52 to finish 43secs ahead of his clubmate Cameron Baird. Heide Biberbach-Laidlaw, 14, from Galashiels, led home the women’s field in 24:54.